Operation Code Vet teams up with Habitat Hillsborough, Owens Corning and Westfall Roofing to help local veteran family. Collaboration and partnership have always been the cornerstone of Habitat for Humanity’s mission to provide safe, decent and affordable housing. Habitat’s work depends on community participation, whether it is the thousands of volunteers who help us build and rehab every year or our corporate friends and organizations that provide building materials and help fund our programs. And sometimes Habitat teams up with other community agencies with similar missions and goals. Such is the case with Operation Code Vet, a non-profit program that is an offshoot of Hillsborough County Code Enforcement. Founded by Hillsborough County Code Officer Christine Zien, Operation Code Vet (OCV) has helped hundreds of low-income veteran homeowners with code violations obtain solutions through the assistance of partnering agencies like Hillsborough County Sheriffs Office, United Way, Bracken Engineering, Crossroads – and Habitat for Humanity of Hillsborough County’s Home Preservation Program (HPP) managed by Jeremy Cooke. Making a difference for a veteran family. It’s a team thing. Last fall, Christine Zien reached out to Habitat’s HPP and Jeremy Cooke to request assistance to clean up massive amounts of overgrowth on the property of veterans Ed and Ruth Bryan. OCV provided the volunteers and Habitat provided the tools and the dumpster. While Jeremy and the volunteers were clearing out the overgrowth, Jeremy and Christine noticed the Bryan family’s roof needed to be replaced. After applying for a grant on behalf of the Bryans via Habitat International’s partnership with the Owens Corning’s “Roof Deployment Project,” Jeremy was thrilled to tell the family and OCV that Owens Corning had approved the grant to provide the resources for a new roof on the home. Soon after, Owens Corning coordinated with one of their independent preferred Tampa Bay contractors, Westfall Roofing, to replace the roof, which was completed in late March. Since the inception of the Owens Corning National Roof Deployment Project in 2016, more than 100 military members have received new roofs. 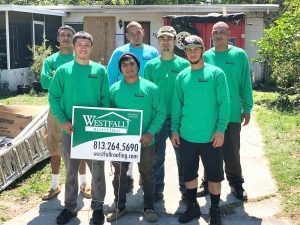 Habitat Hillsborough is grateful to be able to help the Bryans thanks to the generous collaborative effort from Owens Corning and Westfall Roofing. 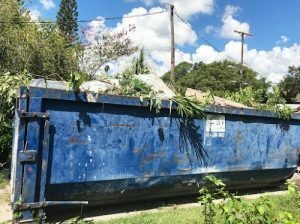 Dumpster full of yard overgrowth. Now that the new roof has been installed, the next leg of the Bryan project features replacement of an old screened-in enclosure that was dismantled by Habitat volunteers so the roof replacement could move forward. The Habitat Home Preservation program will be constructing a new smaller enclosure on the back of the house that will provide cover for the family’s dryer and water heater with the help of Habitat volunteers Bob and Doris Meyer and others. 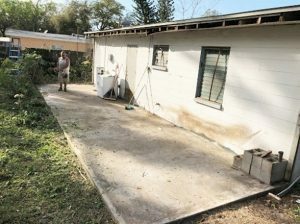 Operation Code Vet will supply all of the materials and Habitat will provide the labor. Back porch deconstructed awaiting replacement. Christine says OCV plans to continue to partner with Habitat Hillsborough. https://www.habitathillsborough.org/wp-content/uploads/2019/03/Blog-page-OwensCorning.jpg 330 780 Robin Macar https://www.habitathillsborough.org/wp-content/uploads/2016/03/Horizontal-logo-2color.jpg Robin Macar2019-03-31 16:40:172019-03-31 23:17:58Operation Code Vet teams up with Habitat Hillsborough, Owens Corning and Westfall Roofing to help local veteran family.